For the spring season 2013, Magasin 3 is proud to present a solo exhibition featuring works by Mika Rottenberg, spanning from the early 2000s to today. Mika Rottenberg’s video installations show an imaginative world of surreal scenes where inane objects are produced in protracted processes resembling factory assembly lines. 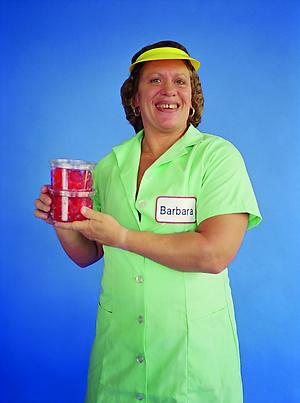 The workers in Rottenberg’s videos are often played by women who earn their living on their distinctive physical features, such as extreme obesity, muscularity, height or unusually long nails or hair. In the claustrophobic settings she constructs, these women engage in the production of maraschino cherries, dough, make-up and wet-wipes in the most astonishing ways. The sets Mika Rottenberg designs for the characters in her videos also partly extend into the exhibition space. The aesthetics of the mundane take on new significance when the web of production and consumption that surrounds us is experienced as both intimately familiar and intuitively unsettling.